In some ways, getting married is like buying a house; it’s a major milestone in life and–almost always–there is initial sticker shock. (“It costs how much? 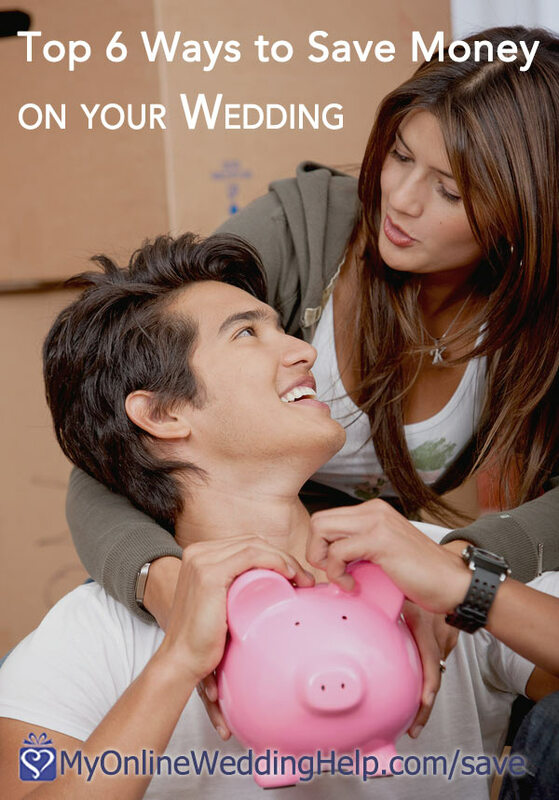 !”) For those of you who cannot afford the average $25,000-ish wedding, some wedding saving tips for keeping both the dream and piggy bank intact are below. Guest count is the largest single determinant of wedding costs (more guests require more food, more drink, a larger space), so it stands to reason you will spend less if you invite fewer guests. Also, a more intimate wedding is more likely to live up to your dream, since you will be able to share more time with those most meaningful to you. Keeping the guest count intimate opens up many venue opportunities. Your parents’ or others’ backyards, walk-out basements, fields, barns, parks, unused buildings, and rooftops all become potential–and inexpensive–wedding venues. Also, when not constrained to often bland reception halls, you open the door for the venue itself to add character to your wedding. For some ideas to get your creative juices flowing, see 76 Unexpected Wedding Reception Venues. You can do everything yourself, of course, but that can be much more stressful for you (i.e. good for the budget, not so good for the dream). If you hire a chef to prepare your favorite specialty and assign side dishes to those willing to help, you get both a culinary treat and family & friends’ signature dishes. If you do opt for having the full menu catered, buffets often cost less per person than equally elaborate sit-down meals. But not always! Compare before you decide. One or more food trucks are another consideration if you are having a fun, casual affair. A wedding planner plays a crucial role in taking the pressure off you so you can enjoy the day. If hiring a full-service planner is out of your price range, there are other options as well. Identify the parts of your wedding most important to you and those with which you are least experienced. Then find one or more professionals who will focus on those elements. Day of coordination is also critical. To do it all yourself is like both directing and starring in your own production. Fully DIY is doable, for sure, but it is a lot more work and likely to be less than dreamy. Your wedding day should be fun for you. Items that play two or more roles in your wedding, or those that will play a role in your everyday life afterward, often cost less than buying each separately. Some favors, for example, can also serve as centerpieces, desserts, or both. Buying shoes you will also use later is another example. Finally, if the groom wears a suit or other clothing he can also wear to work, that’s one less purchase later. By now, the Interent is a big part of our daily live. You can use it to your advantage for budget wedding planning. Product selection is larger and the potential for cost savings is greater online compared to what you can find locally. Veils are a good example. There are forums where you can collaborate with others planning a low budget wedding. Wedding dress: shopped end of season sale since I was a year out and found a beautiful perfect dress for $100. Flowers: had bridesmaid bouquets serve as long table centerpieces at reception so they didn’t have to carry them around and saved money on center pieces. Church: made tulle and artificial flowers sewed onto elastic to easily place over ends of pews. Had a party with friends to make them ourselves. Also, used 2 beautiful potted Boston ferns at altar on wicker stands, used them again at reception, and kept them to decorate our new home after the wedding. Had mid-afternoon wedding and reception so just served appetizers (4 hot/4cold) rather than full sit down meal. Created a CD ahead of time (would now use iPod) for our favorite songs, and used that with our own sound system for music, rather than hiring DJ. Ithank you for these great tips! Would like to add another one- instead of throwing lots of money on expensive photographers, let your guests be the photographers. We did it and it was great. We even broadcasted all the photos live on a big screen during the wedding. It saved us lots of money and it was a unique experience for our guests.